Nang, Kai, Wilson and Cameron gather every Sunday afternoon in a park to practise a rare martial art. They are the only four practitioners of seven star mantis boxing in their state. As the name suggests, the style is inspired by the praying mantis insect. Mantis boxing is graceful and stylish to watch, yet swift, and is one of the more technically demanding styles. The boys begin with a thorough warm-up – the traditional way. Using a bluestone wall as their stretching post, groin, hamstrings and calf muscles are worked on with toes flexed back and then pointed forward. Some of the stretches are quite balletic and graceful to watch. Legs are swung from side to side and kicked out high to the rear. The boys stretch out their backs and hips cat-style before moving out to the oval to get the blood pumping through the wrists, ankles and knees. They leave no muscle unstretched in their hour-long routine. Balance and strength are thrown into the mix with difficult postures, lunges and push-ups. And after all that, it’s time for class to begin! The boys enhance their hand-eye co-ordination by aiming to hit their hands at chin level with their feet. The aim is to make a decent thwack as you hit the hand, to demonstrate focus and power. Even the baby mantises are giving it a good go. I wonder what they want to be when they grow up? Once the boys have worked out their kicks along the cricket pitch, it’s time to raise the stakes. 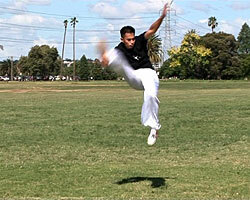 Aerial kicks are spectacular to watch and require a large amount of practise, stamina and skill. Both legs are lifted off the ground and the hand is struck with force and accuracy. Again, these are not fundamental to fighting but Nang says they are good athletics. Nang Ho has been practising mantis boxing since 1993. He runs his Seven Star Mantis Boxing School in a traditional manner. There are no dans and belts here. Nang says the grading system is a western construct introduced to martial arts to squeeze more money out of students. In his school, students progress when they are ready. It’s logical. If a student can master and perform the task Nang asks of them, they will move on to the next task. Static stances are practised next. Crouching, hook, and empty stance are just a few of the postures designed to increase leg strength and balance. Nang goes through them slowly at first, checking his students’ techniques, and then calls them out at random, getting the boys’ brains working just as hard as their bodies. After a few more quick stretches, it’s time for conditioning exercises. Kai and Nang are not banging and grabbing arms just for the hell of it. It’s a great way to increase bone density as the impact encourages bone to lay down more calcium. Next, Nang performs a form called white ape steals the peach, solo. Being an adept practitioner, he has performed this challenging sequence at national competitions. His movements are vigorous, precise and fast. You can see the more mantis-like influence coming through with this form. This is very impressive to watch but Nang warns that mantis boxing is not about how many forms you know. 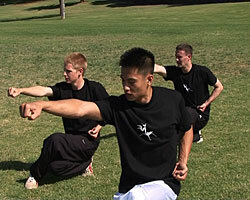 In his classes, emphasis is placed on fundamentals and technique. What’s the use of putting sloppy technique into an advanced form? Kai performs piercing fist by himself. It’s a tiring sequence. According to Cameron, who studied tae kwon do before taking up mantis boxing, the most advanced form in tae kwon do is equivalent to the most basic form in mantis boxing. This gives you some idea how much power and skill it requires of the guys to get through these routines properly. Next, Cameron, Kai and Wilson all partake in the three step routine before dividing up into partners to practise hand sparring. This is the last task of the day. Nang says mantis boxing uses a lot of grabbing, pushing and pulling to get your opponent off-balance. If you can indeed develop the strength and speed to grab hold of your opponent’s hand in mid-strike, it is more advantageous to you in the fight than a punch. Only an open hand can be used in the facial area but fists are allowed on the body in this exercise. It looks fairly aggressive but it’s all done in good humour. At the end of a hard day’s fight, it’s time for a laugh. The boys will meet again next Sunday – same time, same place – for more boxing, praying mantis-style.